John Thomas Minges was a successful businessman and Mayor of Rocky Mount (1964-1973) who helped transform the area from primarily agricultural to diverse manufacturing. His efforts resulted in Rocky Mount receiving an All-America City Award in 1969. 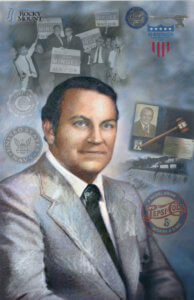 Mr. Minges was a member of a large and prominent family in Eastern North Carolina that owned the Minges Bottling Company and the Pepsi Cola Plant of Rocky Mount. Upon election, Mayor Minges began an aggressive and successful industrial recruitment campaign. When the large railroad shops of the Atlantic Coastline closed in 1969, the city redoubled its efforts to recruit jobs to the area. Nash and Edgecombe Community College was started during this time to provide training and educational opportunities. It took a team effort of an able city staff, the city council and county commissioners to bring Schlage Lock from San Francisco, Abbott (now Pfizer) from Chicago, Texfi, Burlington Mills, Ilco Unican and Rocky Mount Instruments among others to create a robust economic base. To attract these firms, the city’s limited and aging infrastructure needed to be enlarged. The Tar River Reservoir was constructed, the wastewater treatment plant, the Tar River water plant and the area’s electrical system were all upgraded with funds from local bond issues that Mr. Minges helped to pass.